White Paper Abstract: Asthma is one of the most common lifelong chronic diseases, yet more than half of children and more than two-thirds of adults with asthma do not have an individualized asthma plan. 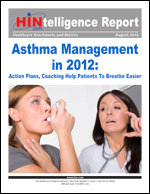 New market research from the Healthcare Intelligence Network has determined that asthma action plans and health coaching are key components of an effective asthma management program. Download this HINtelligence report to learn how 71 healthcare companies are helping individuals with asthma to manage their disease more effectively, reducing the likelihood of ER visits and hospitalizations by this population. This HINtelligence Report provides data highlights on asthma management program components, key stakeholders in improving asthma challenges, reimbursement and ROI, as well as management in a population. Customized reports, including benchmark results by industry sector, are available upon request.